I don't care about the non stick property of a non stick pot. Is there any harm in washing it in a dishwasher? 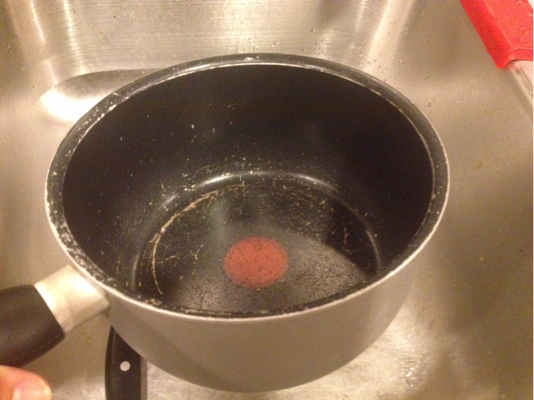 I have this T-Fal non stick pot, and really I don't have any use for the non stick coating. I'm wondering if there's any harm in washing it in the dishwasher aside from the non-stick coating wearing off. In particular I am wondering about food safety. It already looks like the coating has worn off significantly. Without making any health claims (as I don't know what the impact of ingesting particles of T-fal coating), I don't think the dishwasher is going to do more damage, or release any more coating, than your use of inappropriate non-stick utensils already has. ...maybe, just time for a new pot. Most non-stick can survive dishwashers anyway. If it's already scratched the scratches might get bigger but not necessarily. Depending on the metal underneath, there's a chance of it starting to flake off. Once that happens, it's pretty much gone. The downside of the coating coming off is that food sticks worse than it would to a pan that was bare metal to start with. This may have something to do with intermediate surface treatments, and isn't a problem if you're using it for just boiling things in water. Not the answer you're looking for? Browse other questions tagged non-stick or ask your own question. Difference in technique for cooking with non-stick and standard pans? Nonstick pans blistering after dishwasher? Seasoning old non-stick aluminum pan? Cast iron, stainless steel, or anodized non-stick: which makes the resulting product taste best? Is my “non stick” pan kaput? I left my non-stick pan in the oven while it was preheating, can I still use it?